Air Fryer French Fries - Let the Baking Begin! Air fryer French Fries are the deep fried french fries’ healthy cousins. The potatoes are cooked with just a tiny amount of oil but still have a ton of flavor and crispiness. Air fryer is a small convection oven that cooks and crisps the foods by circulating the hot air really fast. The small space promotes crisping up of the foods better than any other convection oven. It is also a healthier way to eat since the calorie amount is only a fraction of those that are deep fried. 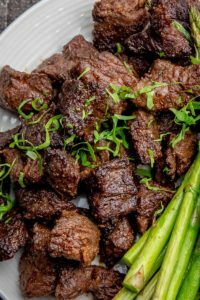 So you get loads of flavor and crispiness, at a fraction of the calories? Oh yes! 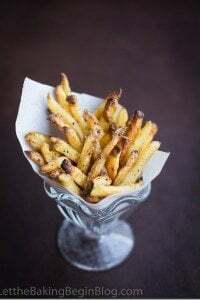 Cut the potatoes into 1/4 inch thick matchsticks if you would like typical french fry size, or cut them to 1/2 inch thick matchsticks if you prefer more of a rustic and meaty french fry. Cutting the potatoes thinner will give you a crispier fry, but cutting them thicker will give you more to bite into. Everyone in our family, except my husband prefer the thicker cut fries :D.
Also, keep in mind that to help the potatoes cook evenly, it is best to cut the potato into a “block” by cutting off the edges. Otherwise, the fries from the edges will cook faster and dry out. Fries cut to 1/2 inch matchsticks. Do not overcrowd the air fryer basket. The space around each piece of food is needed for even cooking and crispiness. Season the potatoes right before you’re ready to cook, otherwise, the fries will be limp. The amount of potatoes is good for a 5.7 qt Air Fryer. Scale the recipe up or down according to the size of your fryer. Preheat the air fryer for several minutes. Meanwhile, toss all ingredients together until the potatoes are evenly coated. Spray the inside of the fryer basket with nonstick spray. For a 5.7 qt air fryer spread most potatoes on the bottom of the basket, then place the top rack and arrange more potatoes on top. 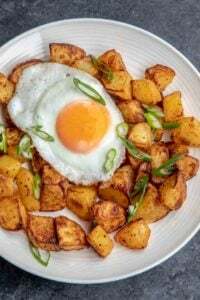 Cook for about 10 minutes, toss the potatoes, then return the potatoes back to the fryer and cook for another 5 – 8 minutes or until the potatoes are crispy and cooked through. 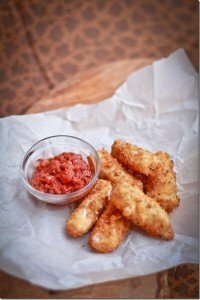 Make these Fries to go along with some delicious Burgers! Juicy Chicken Feta Burger – you’ll make this one again and again! 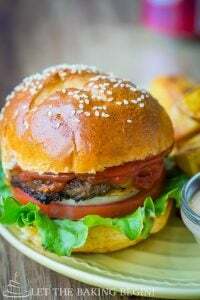 Homemade Hamburger Bun Recipe – especially if you make your own buns! Bacon Cheeseburger – not your typical burger, for sho! Air fryer French Fries are the deep fried french fries' healthy cousins. The potatoes are cooked with just a tiny amount of oil but still have a ton of flavor and crispiness. Prep: Peel the potatoes and cut them lengthwise into 1/4 - 1/2 inch thick matchsticks. The more even the fries, the more evenly they will cook and crisp up. Toss together: In a bowl or a ziplock toss the potatoes with the oil and the seasoning until evenly coated. Load the potatoes into the air fryer, trying to space have at least a little bit of space between each fry. Now load the basket with most of the potatoes. Next, place the rack on top and add more potatoes to the top rack trying to have as much space between each fry as possible. Turn the air fryer to 390F and the cooking dial to 15 minutes. After 10 minutes toss the potatoes to promote even cooking. Cook for another 5-8 minutes or until the potatoes are crispy and cooked through. 1/2 inch fries will take about 4-5 additional minutes to cook.